At optimum efficiency, even in the hot, humid and dusty conditions that characterize India's industrial environment. The Fx2000 adds a new dimension to L&T's AC drive solutions. Built to L&T's stringent quality standards, the Fx2000 is tested and certified to meet global benchmarks, thus giving you the assurance of total reliability. 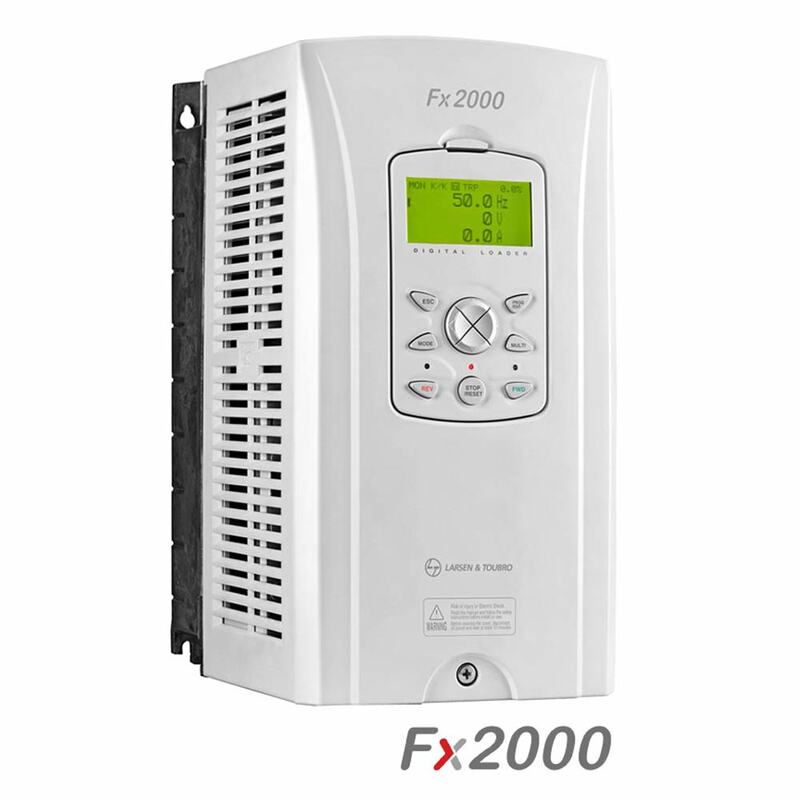 The Fx2000 generates powerful performance and meets your precise needs through several features: superior V/F control, V/F PG, slip compensation and sensorless vector control as well as closed-loop vector control. It has a user-friendly interface and environment-friendly features, including a wide graphic LCD keypad, user and macro. group support, electro-thermal functions for motor protection, and protection for input/output phase loss. The Fx2000 is perfectly suited for the toughest, most complex applications – cranes, plastic winders, high-speed elevators, cement kilns, crushers… and more. It handles loads up to 375 kW - HD / 450 kW - ND, and is engineered to keep your machine operating at optimum efficiency, even in the hot, humid and dusty conditions that characterize India's industrial environment. 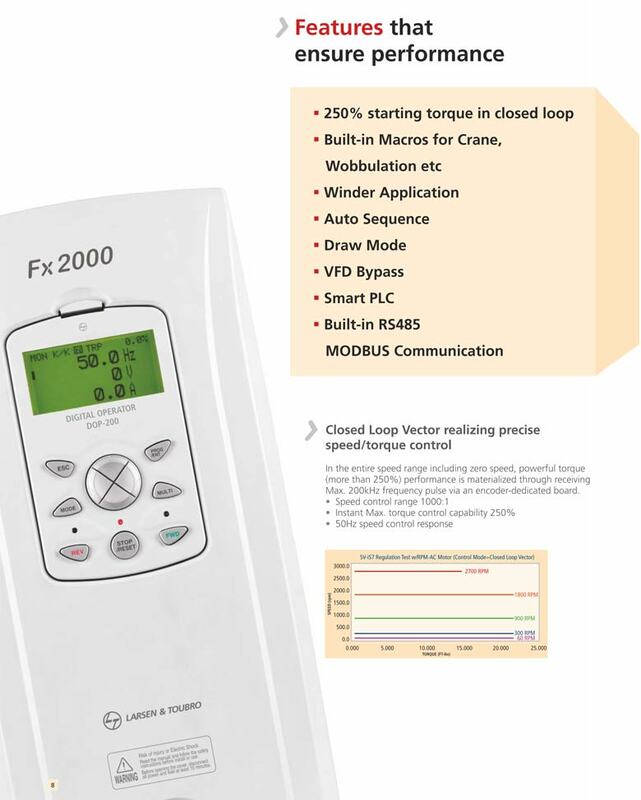 The Fx2000 generates powerful performance and meets your precise needs through several features: superior V/F control, V/F PG, slip compensation and Sensorless vector control as well as closed-loop vector control. It has a user-friendly interface and environment-friendly features, including a wide graphic LCD keypad, user and macro-group support, electro-thermal functions for motor protection, and protection for input/output phase loss. The Fx2000 is perfectly suited for the toughest, most complex applications – cranes, plastic winders, high-speed elevators, cement kilns, crushers and many more. It handles loads up to 375 kW - HD / 450 kW - ND, and is engineered to keep your machine operating at optimum efficiency, even in the hot, humid and dusty conditions that characterize India's industrial environment. 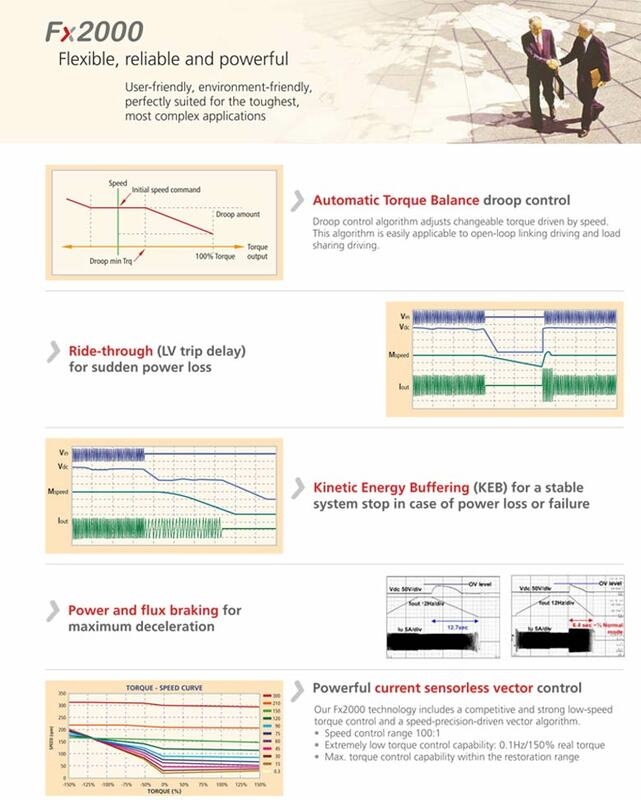 V/F control, V/F PG, Slip compensation, Sensorless vector control, Close Loop Vector Control. Ideal for Heavy Duty Application Crane, Winder, Textile Application, Plastic extruders. Built-in Crane & Wobbulation Algorithm. Starting Torque: 250% at 0Hz for Closed Loop. Conformal Coating complying to IEC 60721-3-3 class 3C2. WEB Software control for Winder Application. Heavy duty operation: 150% of rated current, 60 sec, 200% for 3 sec. Normal duty operation: 110% of rated current, 60 secondss. User can collect parameters that are often used and keep them in User Group. Some parameters for a specific application are in Macro Group. For Crane Control (External Brake Control). Fx2000 provides external brake control function for vertical loads such as Cranes, Lifts etc. User can set Brake Release freq., Pre-excite time. Separate parameters for hoist and lowering. It can operate in Open Loop & Closed Loop System. Tension control with load cell / dancer. It uses the drooping characteristic of the speed with respect to the torque reference. In order to get good quality of product, this machine requires uniform torque from multiple motor. Increase the product quality by load balancing. 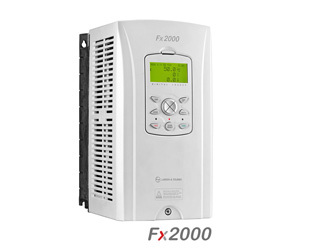 If power-failure occurs, Fx2000 keeps controlling motor with regenerative energy till power recovery. If outage is too long, Fx2000 safely decelerate the motor until it stops. PLC Card (6DI, 4DO, Built-in RTC).